Sales took a big jump in 2017, and so did warranty expenses. But the increases were more or less proportional, which means the warranty expense rates remained about the same. However, the industry's claims and accrual totals are still a bit below their pre-recession peak levels. The global construction machinery industry, like the passenger car and civilian aircraft industries, is dominated by a small number of very large manufacturers, many of which now include their warranty claims and accruals totals in their annual reports. And as with cars and planes, because that warranty expense reporting is now so widespread, it is possible to fill in the blanks and figure out the approximate size of the entire construction industry's warranty costs by estimating the expenses of the non-reporters. For help with our estimates, we turned to the IC Yellow Table, published by the online magazine International Construction. The latest edition of the Yellow Table, published in the April 2018 issue of the magazine, pegs the worldwide construction equipment revenue of the top 50 manufacturers at US$162 billion in 2017, a 21.5% increase from 2016 levels. We cross-referenced the names of the companies in the Yellow Table to our own product warranty expense records and discovered that 23 out of the top 50 construction equipment manufacturers include details about their claims and accruals in their annual reports. And we calculated that they accounted for upwards of 67% of the industry's total revenue. So we decided to tabulate a worldwide figure for construction equipment claims and accruals by estimating expenses for the companies responsible for that remaining 33%. The first thing we needed to do was to translate the sales figures for all the international companies into U.S. dollars. Among the 23 warranty expense-reporting companies, we have manufacturers that report their financials in not only American dollars, but also in Canadian dollars, Japanese yen, Chinese yuan, Korean won, Swedish kronor, and European euro. And so, we relied on the yearly average currency exchange rates used by the U.S. Internal Revenue Service to help us make the translations correctly. Next we had to make some adjustments to the warranty expense data we had on hand, to reflect the fact that construction equipment did not account for 100% of the claims and accruals reported by any of the top companies. At Caterpillar Inc., for instance, construction equipment accounts for anywhere between 55% and 70% of the company's product sales per year. For Deere & Company, construction and forestry equipment accounts for anywhere between 13% and 23% of product revenue, depending on the year. So what we did was to make an assumption that is probably not the best: we assumed that all a given manufacturer's product lines experienced the same claims and accrual rates as the entire company did. That's probably not true -- in fact we know it's definitely not true for diversified companies such as Hitachi Ltd. and its construction machinery division. But we think it's close to true for not-so-diversified companies such as Cat and Deere. And then we had to construct estimates for the warranty expenses of the 27 non-reporting companies in the Yellow Table's top 50. For some, we could find snippets of data here and there, such as a year-ending warranty reserve balance, or the total amount of accruals made per year. But for others, such as the privately-held companies in Europe or the government-owned companies in China, there was no information available at all. So for those, we had to create estimates from scratch. Fortunately, only four of the top 10 and seven of the top 20 companies in the latest edition of the Yellow Table do not yet report their warranty expenses. And the ones that do report those expenses account for two-thirds of the worldwide industry's total revenue. So our estimates, even if they're wildly off, won't upset the outcome by that much. In total, we estimated the worldwide construction equipment claims total for 2017 to be just shy of $2.3 billion, and the worldwide accruals total to be just over $2.7 billion. 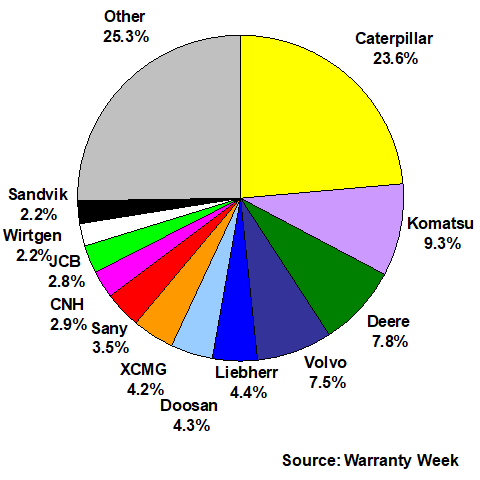 In the pie chart below of the top 12 companies, the data for Cat, Komatsu, Volvo, Deere, Doosan, CNH, Terex, and Hyundai is based on reported warranty data, while the data for the Liebherr Group, the Xuzhou Construction Machinery Group Company Ltd. (XCMG), the Sany Group, and JC Bamford Excavators Ltd. (JCB) is based on our own estimates. These percentages do not line up at all with the Yellow Table market shares, which are based on construction equipment revenues. Here, we're basing the "market shares" on the percentages of the $2.3 billion worldwide claims total estimated to have been paid by each company. For instance, last year, Caterpillar had 16.4% of the industry's worldwide revenue but paid 23.5% of its worldwide claims. Deere had 3.5% of the revenue but paid 7.2% of the claims. Over the ten years we're looking at in this week's report, we found the worldwide average claims rate to be just under 1.5%, and the worldwide average accrual rate to be a little under 1.6%. The expense rates reported by companies such as Deere and Cat are somewhat above those industry benchmarks, because of longer warranties, costlier repairs, higher taxes, parts cost, and other factors. In general, accruals always seem to be a bit larger than claims in this industry, especially in years of fast sales growth. In the long run, after changes in estimate and other adjustments, they would have to be equal. But in the ten years of data we're looking at this week, accruals outpaced claims eight times, and very nearly did so for a ninth time in 2015. Only in the recessionary year of 2009 did claims outpace accruals by a significant amount. In 2017, we estimate that the worldwide construction equipment manufacturers made $2.7 billion in accruals, up by a huge 35% from 2016 levels. 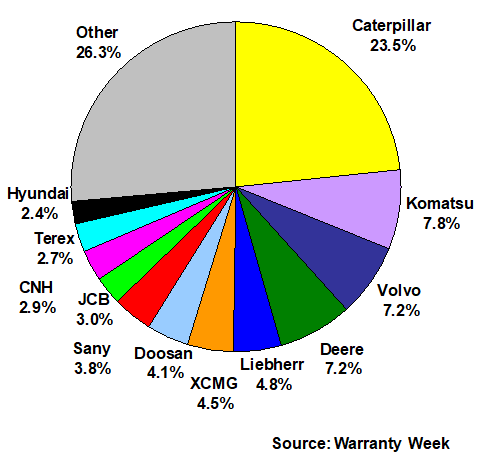 According to the Yellow Table, sales were up by just 21.5%, so there must have been a change in expected warranty cost that prompted the additional accruals. And, in fact, large companies such as Cat, Komatsu and Deere each raised their accruals much faster than sales last year. Volvo and Terex were the only top companies to reduce their accruals in 2017. In Figure 2, the companies are mostly the same but their places in line have changed. Volvo Construction Equipment, for instance, swaps places with Deere, as do XCMG & Doosan, and CNH & JCB. New company names on the accrual list include the Wirtgen Group and Sandvik AB, who take the place of Terex and Hyundai Construction Equipment. Notice that the "other" category accounts for less than a quarter of the total. With the claims total in Figure 1, the smaller companies whose names didn't fit into the pie chart accounted for 23.5% of the worldwide total. With accruals, the other category accounts for 23.6%. With the individual companies, meanwhile, most of the biggest companies also have a slightly larger share of the accruals pie. However, Liebherr, XCMG, Sany, and JCB have a slightly smaller share of accruals than claims. Over the past decade, the worldwide totals for construction equipment claims and totals have risen and fallen, usually in keeping with sales trends. But as we will see in Figure 5, there have been only small changes in the expense rate averages over time, which means that warranty costs are more or less remaining proportional to revenue. In Figure 3, we're looking at the worldwide claims totals of the top construction equipment manufacturers. The portion in dark red is based on the hard number totals we've gathered from the annual reports of the 23 companies that include claims payments in their financial statements. The pink portions are the estimates we've put together for the remaining 27 companies. The 2017 claims total is $2.3 billion, of which nearly 70% comes from reported numbers, and only 30% comes from our own estimates. Claims were up almost 18% in 2017, after a dip in 2015 and 2016. Notice that 2016 had the second smallest claims total of the last ten years. And 2015, at $1.9 billion, has the smallest total in the past decade. Meanwhile, the year 2008, at $2.6 billion, remains unsurpassed as the busiest of the decade. That's because even though the recession began that year, manufacturers were very busy performing warranty work on all the equipment they sold before the downturn. Especially with vehicles and large machinery, there is usually a year or two of lag time between when a product is sold and when the claims hit their peak. It's hard to point to any one company to explain away these highs and lows. Among the warranty-reporting companies, Doosan, Wacker Neuson, and the Haulotte Group saw the largest proportional increases in claims from 2016 to 2017, while Manitou, Atlas Copco, and Oshkosh saw the largest proportional decreases. The ten-year trend in accruals made by construction equipment companies is charted in Figure 4. Once again, the peak year is 2008, but both 2011 and 2017 are not far below that peak. And once again the bottom of the trough is 2015, lower even that the recessionary year of 2009. And once again, the 2016 total is the third smallest of the ten. Accruals totaled $2.7 billion in 2017, an estimate which is 70% based on actual warranty expense reports, and 30% on estimates made for the privately-held and government-owned companies that do not report their warranty expenses publicly. That which we know to be a fact is in dark green while that which we estimate is in light green in the chart below. Note that this is the second consecutive year in which accruals have risen. From 2011 to 2015, the worldwide accrual total declined every year. But in 2017, accruals jumped a brisk 35%, after a 12% increase last year. Doosan, Lonking, Wacker Neuson, Haulotte, Manitowoc, and Kubota raised their accruals significantly last year, helping to drive that industry total upwards. Manitou, Atlas Copco, and Terex were among the few companies to actually reduce their accrual totals. One big reason for the divergence between revenue and expenses over the past decade is the phenomenon of customer behavior during a recession. When sales slow because customers don't want to buy new equipment or replace old equipment, they instead try to keep what they already have in good working order. 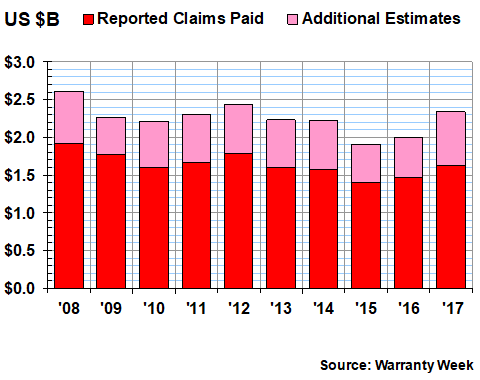 In warranty terms, this means more repairs, which impacts claims rates, since this is calculated by dividing product revenue by claims cost. 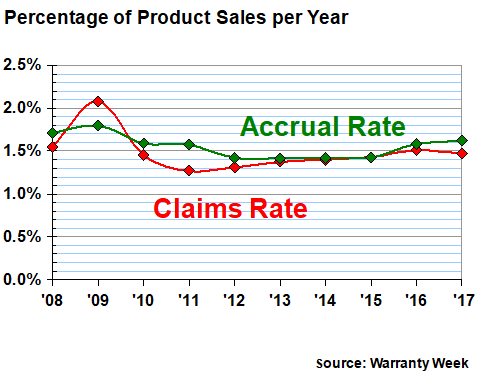 In Figure 5, that rise in the claims rate seen for 2009 is caused primarily by the decline in sales that year. Claims costs declined, but not as fast as sales did, so the ratio between the two metrics actually rose, from 1.6% to 2.1%. And then in 2010 it fell back to 1.5%, as sales picked up and claims remained about the same. Since then, the claims rate has remained very close to its long-term average of 1.5%, though it was up to 1.5% in both 2016 and 2017. For the industry's average accrual rate, the recession had a less dramatic effect, because most companies cut their accruals proportionately as sales fell. For instance, while sales dropped by 35% in 2009, accruals were cut by 32%. So there was still a slight rise in the rate, but only from 1.7% to 1.8%. However, that remains the high water mark for the past decade. More notable is the gradual decline that followed, and the almost flat line that the industry's accruals held at 1.5% from 2012 to 2015. 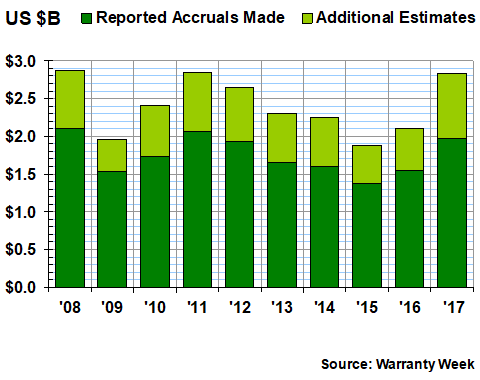 However, also note that the average accrual rate did in fact turn upwards in 2016, and rose again in 2017, climbing above 1.6% last year (based on $2.7 billion in warranty accruals made for $162 billion in product sales revenue). That's not alarming in the least, however. The construction equipment industry's warranty expense rates have remained very close to 1.5% for the past eight years, with a standard deviation of only 0.1% suggesting extreme stability. The increases we're seeing now have more to do with increasing sales, and less to do with increasing repair costs. Daimler Trucks to re-launch One-Stop Warranty in 2019.
Credit cards that offer cellphone protection plans. Which pickup trucks offer the lowest CPO premium? BMW says higher warranty costs weighed on earnings. Citizen Watch app captures and records warranty info using a camera phone. GWC Warranty's company blog wins 2018 Automotive Communication Award. Alpha Warranty Services wins 2018 Utah Top Workplaces award. Kenworth Certified Pre-Owned Program offers two-year warranties. Assurant Global Lifestyle net earned premiums up 43% in 2018. Volvo introduces unlimited mileage warranty for certified used cars. New study lists cars with the lowest and highest CPO premiums paid. Omega lengthens manufacturer's warranty on all watches to 5 years. Rotel lengthens warranties in New Zealand from 3 to 5 years. Apple iPhone battery replacement discount ends in new year. Check the warranty of the gadgets you buy. Tesla's record quarter doesn't look as good as earnings release suggests. 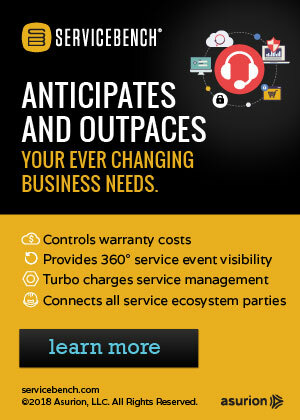 OnPoint Warranty Solutions closes its Series A funding round. Registria launches Owner Math to measure brand engagement. Peterbilt offers new warranty option for certified pre-owned trucks. Hyundai launches performance parts line for Veloster sports car.